The goal of the University of M.U.S.C.L.E. was to collect as much M.U.S.C.L.E. information as possible and house it in one location – with the hope that people would make discoveries or uncover unseen information based on their new understanding of “all” the information. The first example of this synergistic approach has occurred. TheOrgg was reading Matthew G.’s Sociology 300 write-up and clicked on the Kinnikuman Comichara link that was included in Matthew’s spotlight (from Nathan’s M.U.S.C.L.E. Blog). TheOrgg noticed that the 9 figures from the Comichara set matched the figures on the Purple Board Game figure tree. This discovery supports Mr. Smith’s idea that the six Non-MUSCLE sculpts from Part Eight were their own mold (tree) and that the two molds that were believed to be part of Part 8 were actually one combined mold. This entry was posted on Monday, November 16th, 2009 and is filed under Research, UofM News. You can follow any responses to this entry through RSS 2.0. You can skip to the end and leave a response. Pinging is currently not allowed. Whoa! That’s a pretty cool discovery! I never noticed that before. Non-Poster M.U.S.C.L.E. 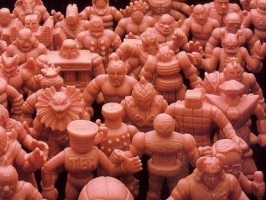 Figures – Gamma « University of M.U.S.C.L.E.